SEO is dead. Long life SEO! 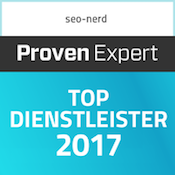 seo-nerd® → News → SEO is dead. Long life SEO! 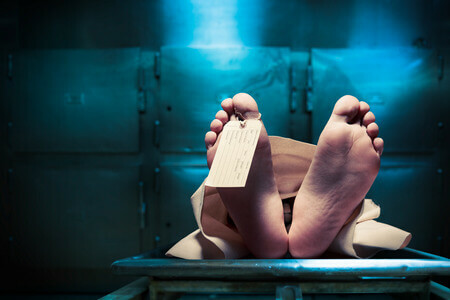 SEO is dead? There’s life in the old dog yet! Mark Twain, Morgan Freeman and even Queen Elizabeth II share the same fate: false death notes, that threw the public into a dither. Exactly the same SEO had to acquiesce for years. „SEO is dead“ can be read from time to time. But just like presumed dead stars, the search engine optimization returns with glory again and again. Why SEO is still alive and healthier than ever before, the seo-nerd knows. Read his tips on content, backlinks, etc. so you do not have to carry SEO to grave. With each new Google Update, the requirements for search engine optimization change. When Google changes its algorithm, the search engine does this to provide users with better search results. Logically, it is therefore one of the core tasks of SEO to show the search engines that a particular page provides the right answer to a user’s search query. Anyone who consistently neglects Google Updates and runs SEO according to the motto “Everything was better in the good old days!“, carries his search engine optimization invariably to its grave. Of course, keywords are one of the most important foundations of search engine optimization. 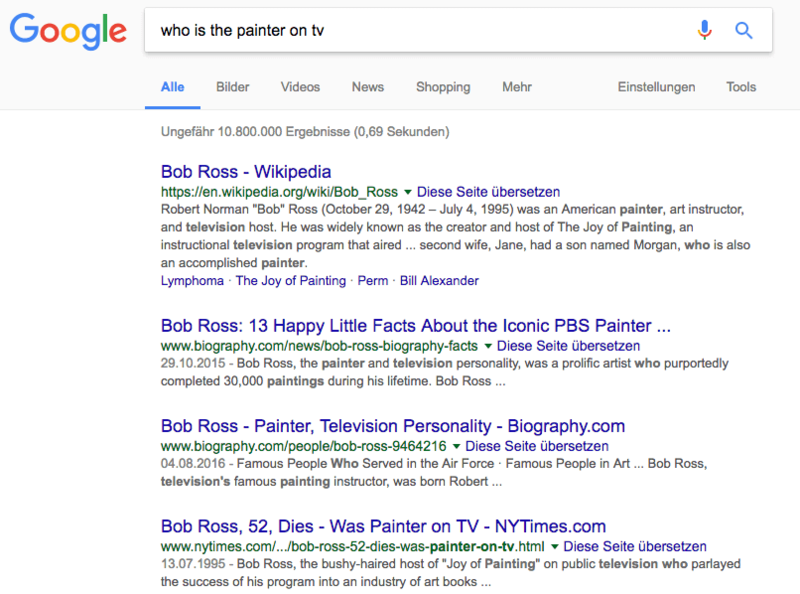 How is Google supposed to know that your site provides the right content and answers for a particular search term if you do not use these keywords properly? The operativ word here is “right”. In order to achieve good rankings, it was common to place keywords without rhyme or reason on a website. 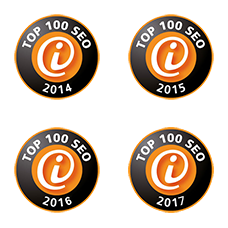 The result was content without overvalues, illegible texts and disappointed users who did not find what they were looking for on one page. Since the Penguin update, this is the death blow for every page. Cloaking is a measure from the Black Hat SEO, where visitors are shown a different version of the site than Google. The background is that the Google Bot and other crawlers can’t read items such as Flash files or images or only to a small extent. While the user can see it, the search engine is primarily based on the source text of the page. When cloaking, the source text is strewn with content, which is not displayed to the user, but the crawler is lead to believe that there is relevant content. But Google is smart and recognizes cloaking very well. The punishment follows swiftly. If you want to know how the Google Bot sees your page, you can check the page using the „Fetch as googlebot“ tool. For this, only a valid Google account and the registration of the relevant page for Webmaster Tools is required. It’s called search engine optimization, but if you only focus on Google and want to make your site palatable only to the search engine giant, you can order the funeral feast for your website straight away. After all, it’s not called Google optimization. Also Amazon, Quora or Pinterest are search engines and their use reflects very strongly the intentions of the users. Ryan Stewart makes this very clear by an example: he had his new apartment furnished by his girlfriend. On Pinterest, she got a ideas, on Amazon she searched by the keywords from Pinterest for the products. On ebay, she looked which products she could buy there more cheaply, but found it a bit to “second hand” and finally bought all the furniture on Etsy, knowing that there are unique handmade products. Why she did not googled? This was simply an unnecessary step for her search. What does that tell you? Many users have already a good overview of which platform meets which requirements due to their previous internet experience. So they often don’t go the indirect route through Google. Get your (potential) customers where they are. The trend is clearly to optimize the search experience. Coffin nail #4 – Content, what’s that? Automatically generated or copied content was obviously a good way to minimize the workload. With the Panda Update, which is now part of the core algorithm, Google’s focus has been on content and punished serialy pages with thin or duplicate content. 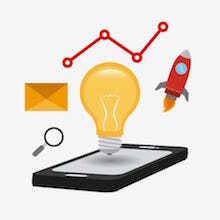 Instead of having to fill texts with many keywords without meaningful information, today it is a task of the search engine optimization to provide content with added value, which offers the user what he expects (and more) and so gives Google the prove for relevance of the page. 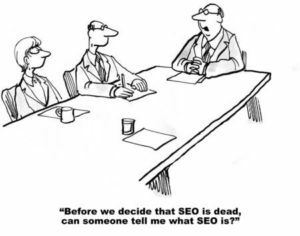 SEO is only dead when you don’t know how it works. When Google was in its fledgling stages, it worked analogous to scientific publications, where reference and source data belong to the basic principles of serious work. In this sense, linking of web pages was an important ranking factor for Google. The importance of backlinks has been used by SEOs over and over again and with style link building in long con. The more backlinks, the better – that was the mantra for a long time. Link farms sprang up like mushrooms, marketing budgets were blown for link buying and who tried to operate the whole less noticeably used link exchange with other side-operators. Again, Google’s penguin has done a good job and greatly minimized the importance of backlinks. What is usually still considered as a future vision is already an old hat for the seo-nerd. While many agencies are using lengthy seeding processes to create backlinks over backlinks, for the seo-nerd this is a pleasing benefit. Rather, it is about optimizing pages so that they are viewed as valuable and recommendable by users or other site operators. The focus is on brand building and building up a reputation. The resulting natural backlinks are a nice side effect, but not the main goal. The seo-nerd knows: the more differentiated the Google algorithm becomes, the more precisely the individual SEO measures have to intertwine. SEO has to target the end-user – and these are not the search engines, but the searchers. But how does the seo-nerd manage to make them panting for your site? Content is King? No king without a strong parliament! With good content alone you do not automatically forward your website. Imagine you have a good king (or queen) in a parliamentary monarchy: it represents your side, but can not lead the government alone or unset the parliament. Good content always needs other strong factors with which it can be successful in the long term. In addition, content, like a good king, has to link lasting values with the current events. This means in concretely: Your site must provide both evergreen content and current requirements. The task and the strength of SEO ist is to meet the long-term needs of users and to respond to current trends. You have a great page with informative texts, illustrative tutorial videos and luscious infographics? Very good! Your page needs half an eternity until it is loaded? Very bad! This is the first point at which users jump off and leave your page. The same applies to the lack of mobile optimization. Meanwhile more websites are visited from mobile devices than from a desktop PC and already since the Hummingbird Update 2013 Google preferred sites with Responsive Design. However, fast page speed and mobile optimization alone do not provide an optimal user experience from a technical point of view. A flat page structure, easy navigation and secure encryption via https ensure that your site is as easy to use as possible for your users. Search engines today are not only able to interpret different grammatical forms and synonyms of a keyword. They go further with their linguistic understanding of search queries. The targeting of search engines to the semantic search would like to interpret as exactly as possible what the user might have meant with his search query. 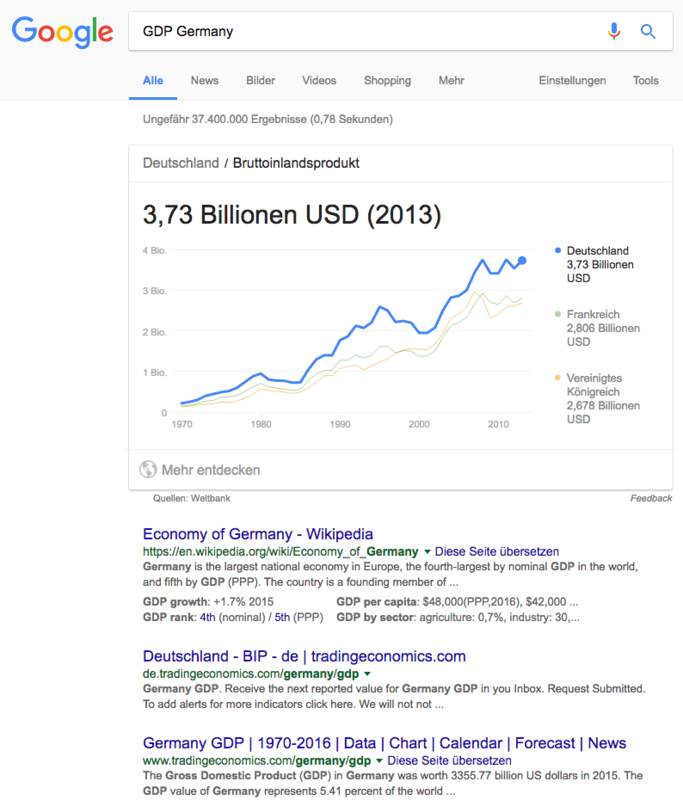 If you google, for example, „GPD Germany“, Google delivers immediately the answer and you do not have to trudge through numerous economic articles. What does this mean for SEO? It is quite clear that a website needs to be much more focused on the user than on the search engine. Therefore, content must not be optimized exclusively on keywords, but on topics (ie relevant issues). Furthermore, structured data are extremely helpful in order to assign a certain meaning to search engine terms. The fact that backlinks will no longer have any influence on the ranking of a page is (yet) a speculation. It is clear, however, that with a linkprofile long quality precedes quantity. Links from dubious or thematically simply unsuitable sources harm your side. 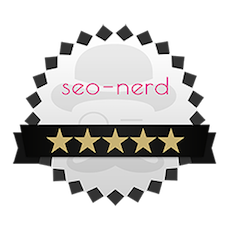 Therefore, the seo-nerd performs a backlink analysis to clean up your backlink profile. In the further search engine optimization it is not then about the construction of new Backlinks, but to present you as expert on your area. This is how links are evolving naturally, for example through social sharing, because your site is recommended by users because of their quality. While other agencies are only gradually withdrawing from active linkbuilding, the seo-nerd has refrained from doing so at the outset and knows how successful SEO works without link building. Take advantage of this lead! SEO is becoming increasingly an interdisciplinary issue. And that does not lead to the death of SEO, but is just the strength. The seo-nerd looks beyond the box and knows that search engine optimization is not a stand-alone method. 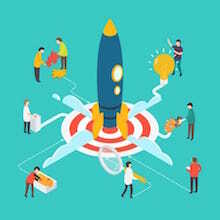 It works together with other marketing measures and must always be individually tailored to the character of the company and to the respective target group. The seo-nerd has always been clear that one can not rest on old-school methods. 5. Coffin nail #4 – Content, what’s that? 9. Content is King? No king without a strong parliament!